Parents often labor over how to pack a nutritious and delicious lunch box for their children, but when a child suffers from gluten intolerance, the task can become monumental. Since white bread usually is the star of the lunch box lineup, French Meadow Bakery has developed a tasty new sandwich bread as the perfect midday staple for children (and even adults) living with gluten intolerance. Made with fluffy egg whites and a sweet touch of honey, this all-natural bread is ideal for a hearty sandwich stuffed with delicious fillings or as a savory snack topped with cheese or peanut butter. 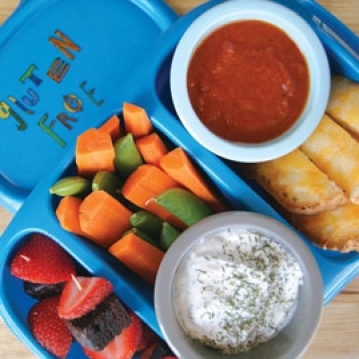 For a delicious, glutenfree lunch box, begin with plenty of fresh fruits and vegetables. Next, instead of the everyday sandwich, make savory Italian Dunkers (with zesty marinara sauce on the side) for an exciting change of pace. 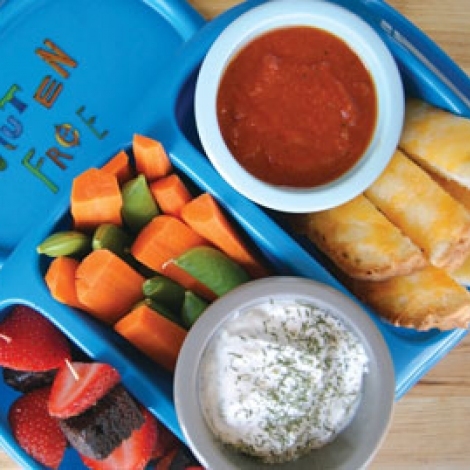 Kids will love the easy-to-eat and fingerfriendly lunch, and moms will love serving a wellrounded, nutritious meal. For more information about delicious products that make gluten-free meals-on-the-go possible, visit www.frenchmeadow. com. Sprinkle cheese over bread. Sprinkle with garlic powder, if desired. Broil on medium shelf for about 4-5 minutes, until cheese is golden brown. Slice into strips. Serve with marinara sauce.